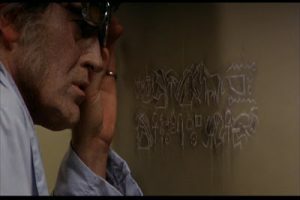 Oh, Bruce Campbell, how do I love thee? Let me count that ways. I really am tickled to no end that Campbell has had a long and thriving career. The man is funny, and he’s a joy to watch. So why not treat yourself to some Bruce this weekend? Better yet: why not treat yourself to some Bruce as Elvis this weekend? 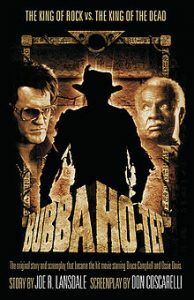 Here are five reasons to plunk down with Bubba Ho-Tep. Did you really think that you were going to get away from this recommendation without the mention that Bruce is Elvis in this movie? No way in hell. The backstory of how Elvis managed to become trapped at an old folks’ home in the South is pretty clever, and he plays The King to perfection: none-too-serious, with a healthy dose of “I used to be a legend.” I’m a huge Elvis fan myself (really, me singing “Jailhouse Rock” is both fascinating and grotesque), so this was the perfect marriage for me. 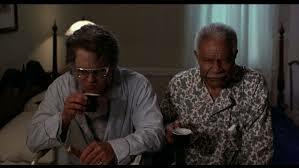 #2 – Ossie Davis as J.F.K. Never thought you’d see a black J.F.K., huh? This movie likes to make dreams come true. The interesting thing is that Davis’s Jack is a complete hoot. He’s funny when he’s explaining his skin color. You’ve got one of two choices here: you can think that this is an old man in the throes of dimensia, or you can believe that it’s a giant government conspiracy to hide an assassination attempt. And you want to believe Davis because he’s fun and earnest. Well done, Mr. President. Elvis and Jack, together at last. Did you realize that this movie was a novella before it made it to the screen? It is indeed. Better yet, it’s written by Joe R. Lansdale. Sound familiar? He’s the same guy that brought us Cold in July and the Masters of Horror installment Incident On and Off a Mountain Road. His writing can be gritty and brutal, and often zeroes in on the worst kind of villain: the human monster. It also has bits of pitch black humor in it, which is a plus. #4 – It’s Don Coscarelli! Come on, people – this man gave us the motherfucking Beastmaster. I will love him forever for that film. The fact that he also gave us a story about J.F.K. and Elvis fighting a mummy in an old folks’ home just adds to the love affair. He knows how to make something wry and poignant at the right times. Lansdale’s tale is in good hands here. When we first meet our crew at The Shady Rest Retirement Home, no one is in good shape. Elvis has some serious erectile dysfunction, and no one really has any pep in their step. Once the adventure with the mummy comes up, though, we get to see spark. There’s suddenly something to fight for. So often, we want to write off the elderly because, well, they’re at the end of their lives. This film goes a long way in showing you that old age doesn’t necessarily mean that you have to stop living and having adventures. This one’s available on iTunes and is worth every penny if you haven’t seen it. If you have seen it, return to an old friend. I’m sure The King would be happy to see you.